This paper uses a common example of natural organization in order to demystify the phenomenon of evolution in nature. The example is inanimate: the evolution of all plumes and jets in one direction in time, from any cross-sectional shapes to round cross sections. The arrow of time points in one direction, and this direction is captured by the constructal law of design evolution in nature. The prevalent view in science is that evolution is a phenomenon of biology, and that it cannot be witnessed in our lifetime. 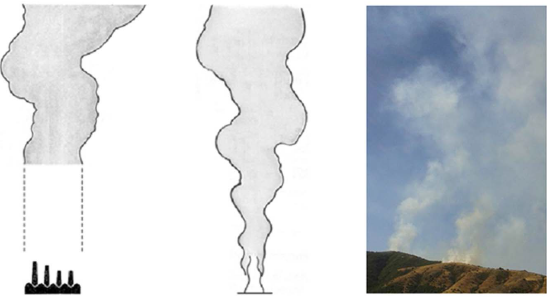 This paper shows that in plumes and jets we witness evolution in real time. We also see the physics principle of evolution, which also allows us to predict turbulence as a phenomenon of physics. I do have some specific questions about the thesis “constructal theory or constructal law”. The problem of a rising cloud is certainly complex to model, however at a very basic level it is not different than the individual particles “histories” taken separately. If we consider an individual particle of lower density, rising in denser column of air, its path will be chaotic as it collides with other particles along the way. Its path will be determined by those random colilsions it encounters. If we neglect interactions then a “cloud” is really the same problem times N particles. But in every case, these problems are reducible to particle phenomena, and to basic force diagrams, frictional coefficients, F=ma, “stickiness”. My question is, where is the “evolutionary” principal in such a case? It is not necessary to test this theory with such complex phenomena, as turbulent flows because they are physical manifestations of particle phenomena acting in microcosms (change the particles and see what occurs in the column or flow pattern). LIkewise, crystal structures are dictated by molecular bonding symmetries, particle properties of or by the fundamental unit that is composed, not strictly energy flow. It should prove itself in much simpler reductive particle models and force diagrams. At least (and I’m arguing another side here since this paper makes the “evolutionary” bridge) in the same way that evolutionary systems are proved out” by other simpler cases.